About "The Secret Message of Jesus"
Pastor and bestselling author McLaren ("A New Kind of Christian") explores Jesus's teaching in this book, placing it in its Jewish context, analyzing its tenets and expression, and trying to work out how it should be lived today. 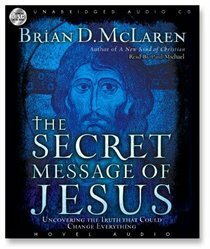 McLaren starts with the assumption that the church may not have accurately understood Jesus's "secret message" (hidden "as a treasure one must seek in order to find"). He revisits the gospel material from a fresh -and at times radical -perspective. The church has focused on salvation as a means to "heaven after you die" for too long, according to McLaren; we should take Jesus at his word when he says "the kingdom of God is here now," and work to assist that kingdom by being peacemakers and loving others. McLaren admits to not exploring every topic here in depth, in an effort to keep the book brief, but he does an excellent job of capturing Jesus's quiet, revolutionary style -the prophet who spoke in parables, who didn't want people to talk about his miracles, who challenged established Jewish thought, and paradoxically found ultimate fulfillment and victory through death. Conservative evangelicals will be critical of some points (and there are weaknesses here), but this book will appeal to a broad spectrum of people who want to understand Jesus. In The Secret Message of Jesus, McLaren clears away the dust of two thousand years of the Christian religion to get to the most important questions facing Christendom: Could it be that the church has misunderstood or, in some cases, intentionally distorted Jesus' core message? What if Jesus was right--but right in different ways than we ever realized? What if many of us have carried on a religion that somewhere along the way missed rich and radical treasures hidden in the essential message of Jesus of Nazareth? // McLaren calls us to look hard, think deeply, and search long with him ... even if the answers overturn our conventional ideas, priorities, and practices. // "Through the years, I have frequently had an uncomfortable feeling," writes McLaren, "that the portrait of Jesus I found in the New Testament didn't fit with the images of Jesus in the church." Out of that nagging discomfort arose this ground-breaking book. He writes, "I'd like to share my search with you, and invite you to be a part of it. I don't want to spoil the ending, but I'll let you in on this: the farther I go on this search, the more inspired, moved, challenged, shocked, and motivated I become about the secret message of Jesus." Brian D. McLaren (MA, University of Maryland) is founding pastor of Cedar Ridge Community Church, an innovative, nondenominational church in the Baltimore-Washington region. He's also a senior fellow with emergent village(www.emergentvillage.org), a growing generative friendship of missional Christian leaders. He is the author of three best selling books on Emergent beliefs written in the form of fiction The Last Word and the Word after That; A New Kind of Christian: A Tale of Two Friends on a Spiritual Journey and The Story We Find Ourselves In: Further Adventures of a New Kind of Christian. Three books on Kingdom beliefs, A Generous Orthodoxy, The Secret Message of Jesus, and Everything must change: Jesus, Global Crisis and a Revolution of Hope. and a book on Emergent Spirituality Finding Our Way Again: The Return of the Ancient Practices . Paul Michael has become one of America's most versatile and respected readers of audiobooks. He developed his wide-ranging vocal repertoire through starring in a series of British sitcoms, and starring or guest-starring in dozens of films, TV series, and made-for-TV movies.